Aha Education, LLC instructors are Texas certified educators with a background in education administration, robotics, STEM, core education, elective education, private/public, home school, and beyond. With more than 40 years of total experience, we are educators committed to providing all education systems with 21st century education. Robo Joe has been teaching robotics for the last 10 years including programs in elementary, middle, and high school. With a passion to give all children a practical pathway to prosperity, Joe has pulled together a team of high energy instructors who share the same common goal which is helping kids find a love for STEM education through project based learning such as robotics, technology, and engineering. 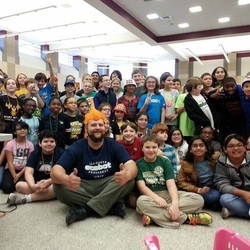 He is a Baker University graduate, Texas certified teacher, Infinity Project instructor, CISD District Teacher of the Year, and holds composite certifications allowing him to teach more than 26 different programs including robotics which is his passion. Joe has been working with the All Earth Ecobot Challenge program as the Lead Teacher, Curriculum Writer, Lead Trainer, and Game Creator since 2010. In 2008, the program he developed for Channelview ISD was discussed by the TEA as a "Model program for the diversification of his classroom with LEP, SpEd, At-Risk, and general ed students all mixed in one class and learning math, science, and engineering in a purposeful way". Now, he spends time working through his company, Aha Education, LLC, passing on his experience and knowledge to many education systems throughout Harris County. Misty graduated with a Bachelor's Degree in Biology from Texas A&M Corpus Christi in Biology. Misty has worked several years managing Aha Education's staff and programs. She enjoys getting her feet wet through teaching STEM Biotech concepts at Aha's various camp programs. Currently, she is also working with Baylor College of Medicine Academy as a Biotech teacher. "My passion to help children prosper through education has grown exponentially and I am here to help make sure that every child gets the maximum opportunity available through our project based education!"